Tara immediately senses there is far more at stake than one man’s life. At his government lab in the New Mexico desert, Magnusson had developed groundbreaking technology with terrifying potential. Working alongside the brusque but charismatic agent Harry Li, Tara discovers that Magnusson’s daughter, Cassie, has knowledge that makes her a target too. The more Tara sees into the future, the more there is to fear. She knows she has to protect Cassie. But there may be no way to protect herself—from the enemies circling around her, or from the long-buried powers stirring to life within. . . I've been wanting to read this book since the first time I heard about it as it sounded really cool. And it is! I love this book. The mix of tarot and profiling is very well written and Williams sure knows her tarot too I can tell you. The story is suspenseful and compelling with rich and vivid descriptions and even though Williams uses various viewpoints this didn't distract me from the story as sometimes happens, but instead it felt right as it gave me extra insight in the story that made it come even more alive. Tara is a character you can really care about and I was happy to see her grow throughout the story. Voodoo Bride wants me to add she loves the romantic storyline in this book and I have to agree with her that it really fits within the overall story. All in all I hope there'll be many more books in this series as I want to know what's next for Tara. Anyone with an interest in tarot will love this book as well as anyone who likes a decent Urban Fantasy story that doesn't focus on creatures, but more on personal magic powers. Alayna Williams also writes under the name Laura Bickle. That sounds fantastic! I gave a paper once on the symbology of the tarot in King Lear, so I'm all over this one! I keep thinking I should get into Urban Fantasy. I cut my reading teeth on SF/F. I read a fair amount of Paranormal Romance. You'd think Urban Fantasy would be right up my alley. 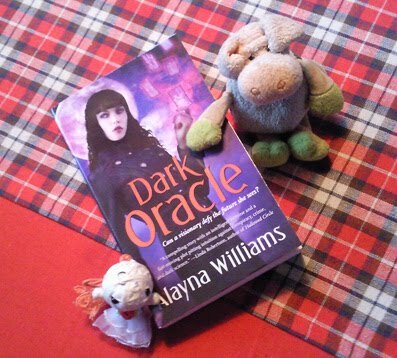 I'm so excited that you enjoyed DARK ORACLE! @Alice: I think you'd enjoy Dark Oracle even if UF isn't normally your thing. @Alayna: I love it! I'll be rereading this one often. I might. But it would be better with zombies in it. 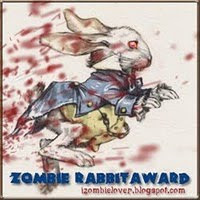 Everything's better with zombies in it!